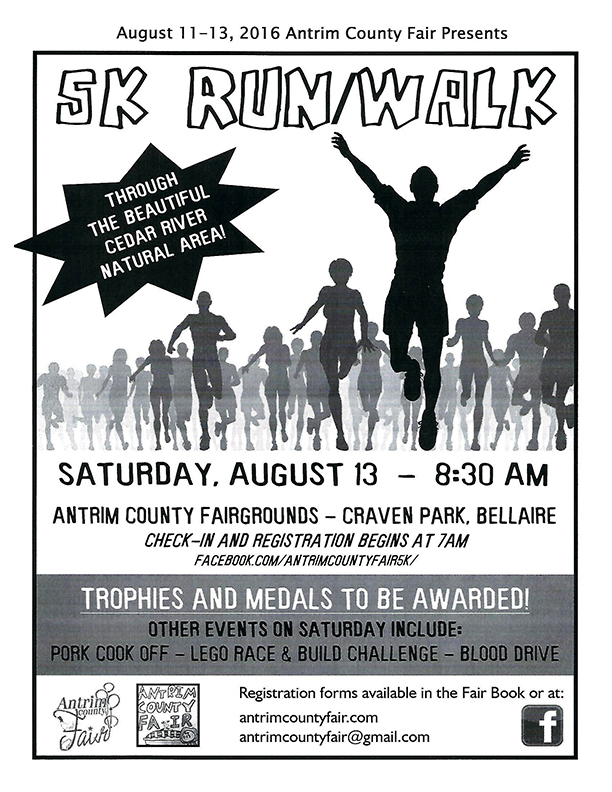 We are proud to announce the 3rd Annual Antrim County Fair 5k Run/Walk (Saturday, August 13, 2016)! 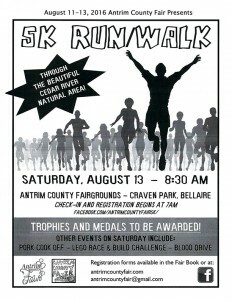 The 5k course will take you through the trails of the Cedar River Natural area. Meandering through the woods and over the river, you will find this one of the most scenic races in the area. A short portion of the race will be on a paved road, before leading you back into the Cedar River Natural area trails and to the finish line. Late registration and packet pick up will begin at 7am on race day at the Antrim County Fairgrounds located on Stover Road in Bellaire, MI. The race will begin at 8:30 am. Awards will be presented after all participants finish the event. Awards will be presented to the overall male and female finisher. In addition, medals will be presented to the top three finishers in each age group for females and males. The age groups will be as follows: 0-5, 6-9, 10-14, 15-19, 20-29, 30-39, 40-49, 50-59, 60-69 and 70 & over. Come for the race, stay for the pancake breakfast, music and more fair fun!